Read Text Extension uses an external program or a web service to read text. Read the selection with Calc, Draw, Impress, Web Writer and Writer. Read the contents of the clipboard. Use speech synthesis to help to edit documents. Compare computer documents with printed documents. Learn a new language. Learn how to pronounce words correctly. Easily transfer text to your mobile device using QR Codes. Read Text Extension lets an external program or web application read text from Writer, Calc, Draw, Impress, Web Writer or the system clipboard. If you use it to read text aloud, it can help you to edit your writing or to compare your document's text with a printed document. If you use it with a web application, you can translate your text to another language or check punctuation and grammar. It can help you to learn a new language or to find out how to say words you do not know. To use it, highlight some text. If you are using the word processor or the HTML editor, you can highlight several selections by holding down the Control key. When you have highlighted some text, select Tools - Add-Ons - Read Selection or click the Read Selection button on the tool bar. To read the system clipboard, select Tools - Add-Ons - Read clipboard. If you can't read the screen easily, consider a system-wide accessibility solution for Apple OSX, Gnome, KDE or Microsoft Windows. If you have installed a system-wide accessibility solution, and it is activated, then you might not need this extension to read text aloud. You can use the Read Text Extension to read using a different language or voice, to save speech as an audio file, or send the text to a web application. The Read text extension uses temporary files to send information to external programs. Depending on the security set up of your computer, other users or programs might be able to read the contents of files that the the extension or other external programs produce. If you are concerned about privacy, launch this add-on again with no text selected to replace the temporary file that contains the text you want to remain confidential. The paths and names of any temporary files directly created by the extension are shown in the Command and Script areas of the About... dialog. Read Text extension uses your computer platform's built-in speech synthesis application by default. For example, Linux uses espeak. Apple OSX uses say. Windows uses the system's SAPI5 voices. A Windows computer can read with a different voice or language if you install an additional SAPI5 voice. 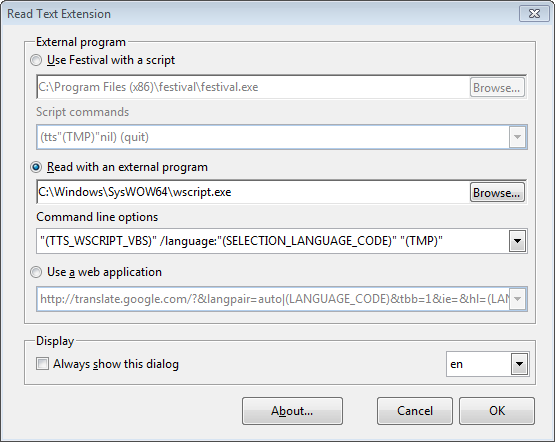 External programs can give your computer the ability to use different languages or voices. To use text to speech with a command-line based speech synthesis program like Festival or eSpeak on your computer, you may need to install extra speech files for your language and dialect. Custom voices will only work if they are installed. If you are using espeak with a recent release of Ubuntu Linux, you can install mbrola voices using the package manager. For other platforms, see the espeak-mbrola web page for instructions how to install voices from the mbrola project. The external application can be any program you can start with a command line that can read plain text documents. If you have an Internet connection, you can get started reading text aloud right away using different languages or voices without installing software by using the web application option. The extension uses your web browser or media player to play the selection. The main dialog of the Read Text Extension includes access to a web application for creating QR codes. QR codes are patterns of squares that embed text in a visual image so that mobile devices can quickly and reliably read information with a built-in camera. The application is powered by the Google Chart API. Read the on-line help for more information. AppImage support, updated documentation, bug fixes and performance improvements. Main tool bar icon resized for LibreOffice 6; Ubuntu 18.04 speech synthesis compatibility. Update links; fix support for Gstreamer sound playing in Linux. Read Text 0.7.28 works better with non-English versions of the Windows 8 Consumer Preview.